If you were lucky enough to be a candidate for dental implants when you needed to replace your missing teeth, you have the benefit of having functional and beautiful teeth that mimic your natural teeth. Dental implants make it easy to eat, smile and talk with ease. They do not pose the threats that dentures pose, such as slipping while talking or eating or making embarrassing clicking noises. They also allow you to eat whatever you want without worry about knocking them loose. One thing that many overlook, however, is the risk of not caring for your implants. Just because they are not "real" teeth does not mean that you cannot suffer damage as a result of not caring for them. 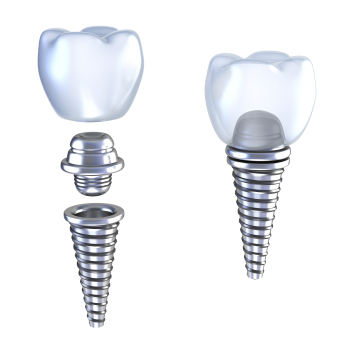 The benefit of dental implants is being able to have a root on the artificial tooth. The problem is, however, that infections can still occur in your gum tissue, which lies underneath the dental restoration. Whether you have implant supported dentures or a dental crown, there is still the risk of infection occurring underneath the restoration. The most common reason this occurs is because patients do not properly brush the areas where the implants lie. Instead, they assume because they are not real that infection will not occur. When food debris, bacteria, and tartar get stuck in the crevices of the restoration, infection occurs, which can knock an implant loose. In general, implants are a successful treatment, but if you have the bad habit of smoking, they can fail. There are many reasons that smoking is bad for your implants. On one hand, it makes it very difficult for your implants to even take in the first place. This is due to the inflammation that smoking causes to the gum tissue, making it very hard for the implant to fuse to the jawbone. Because smoking makes it much harder for your soft tissues to heal after the surgery, it can make the implants fail before they ever had a chance to help you. If you are able to successfully obtain implants, starting to smoke after they are complete puts you at risk for disease and infection which can render the implants a failure. The best way to ensure that your implants stay strong and intact is to take care of them with regular brushing and flossing on a daily basis. In addition, you need to consider your diet. Your gum and bone tissue still needs adequate nutrients in order to stay strong. Think of the food that you consume and make sure that you brush your teeth as soon as you can after eating. In addition, coming in for regular checkups is crucial. This is a step that many people avoid since they assume that they do not need a cleaning or check-up since their teeth are not real. In reality, a check-up is even more important for those with dental implants because of the risk of infection. If we notice an infection starting, we will help you to eliminate the infection and get back on the road to overall dental health. If you have dental implants, we cannot stress enough how important it is to keep them clean. This means brushing, flossing, and eating a proper diet. If you are concerned about the integrity of your implants, talk to our office about what you can do to fix the situation. Your dental implants are meant to last for the duration of your life, but just like your natural teeth, if you do not care for them, they will not last! Please call us today for an appointment if you need help with your dental implants to ensure your optimal oral health.